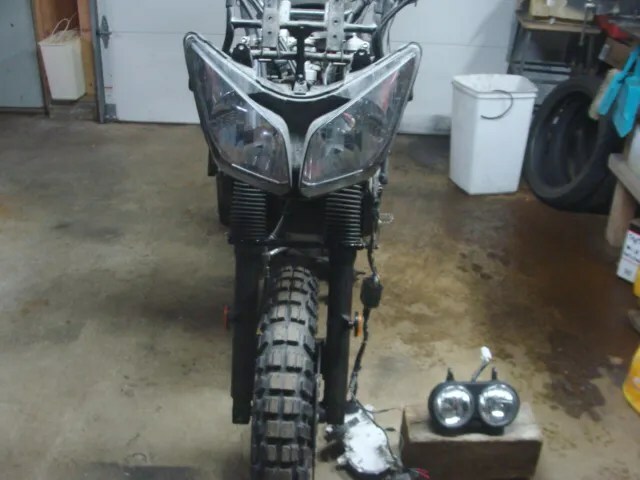 Here is what a new set of Buell Ulyssess headlights look like. 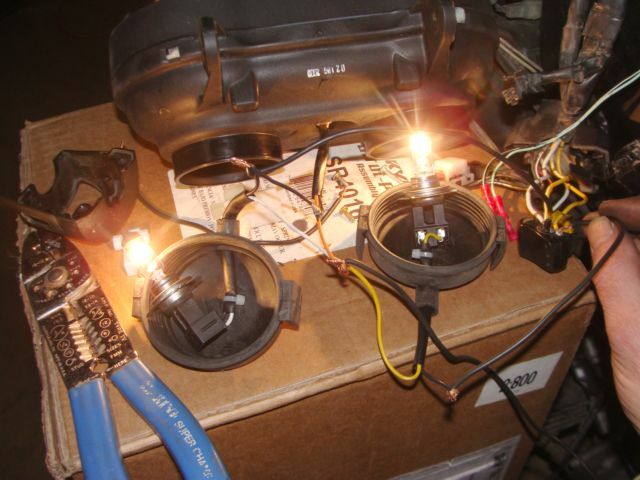 This is what they look like in comparison to the OEM headlights. 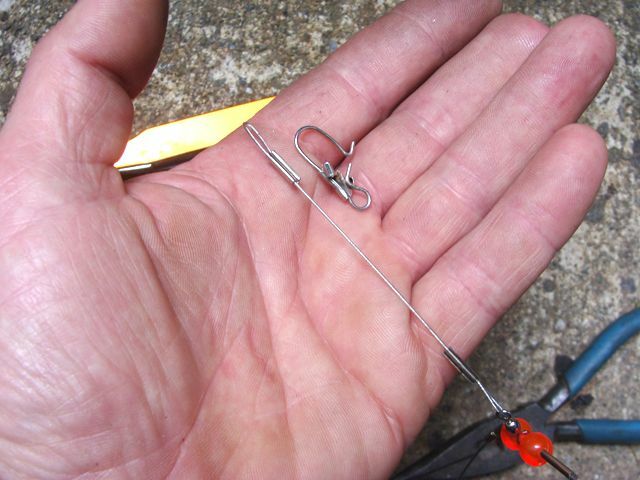 Tiny little buggers, aren’t they? 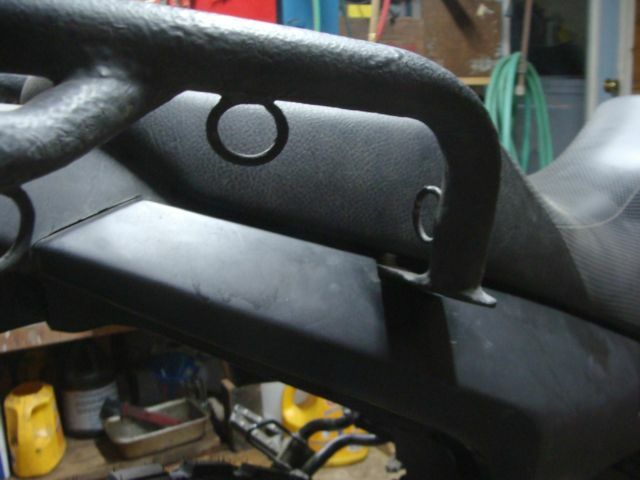 With the Suzuki headlights removed, I used some scrap steel that I had on hand, and fabricated a bracket that I welded to the factory fairing structure. 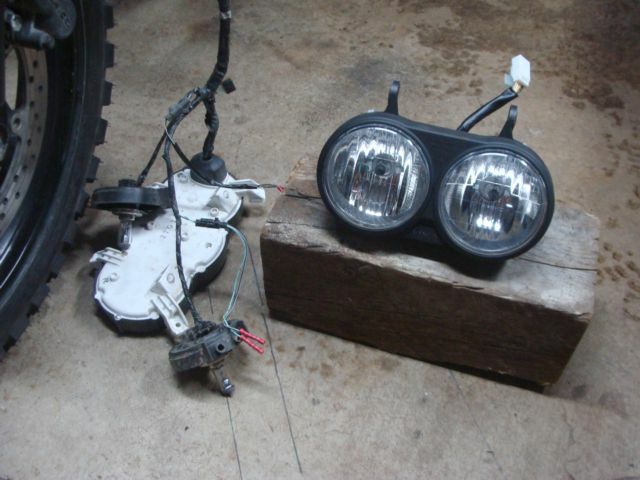 Here are two shots of the Buell headlights temporarily bolted to my motorcycle. 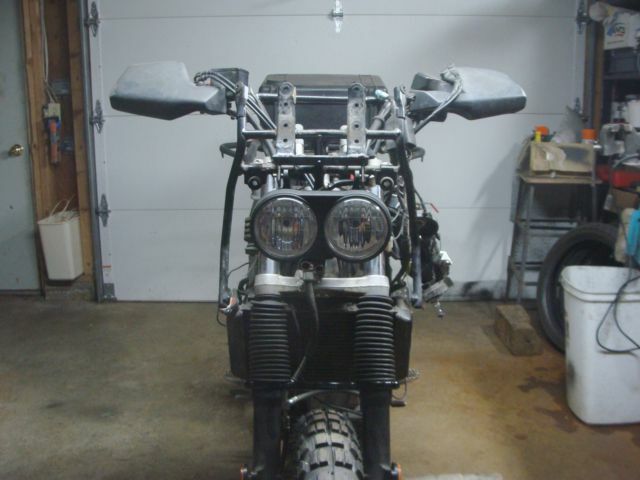 After the Buell headlights were “hung”, I needed to fabricate a way for me to adjust the unit “up”, or “down”. 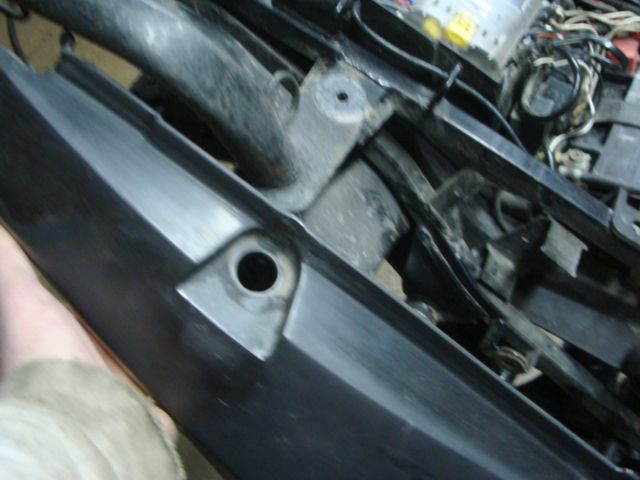 I discovered that a short piece of steel tubing slid nicely into the stock structure. 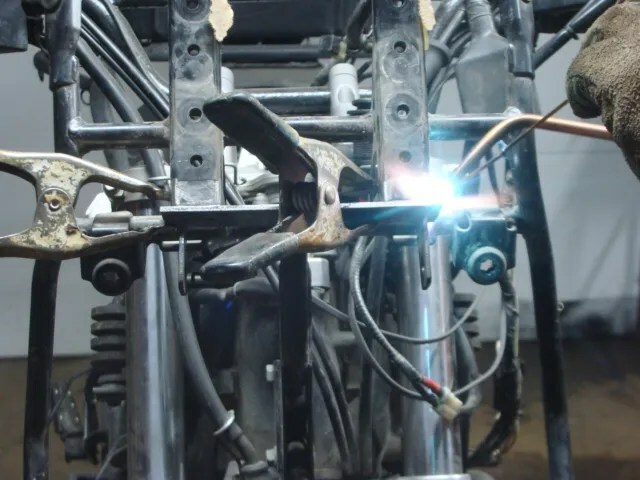 Out of more scrap steel, I welded up an “adjustment tang” that would attach to the bottom of the headlight assembly, and slide into the steel tube. 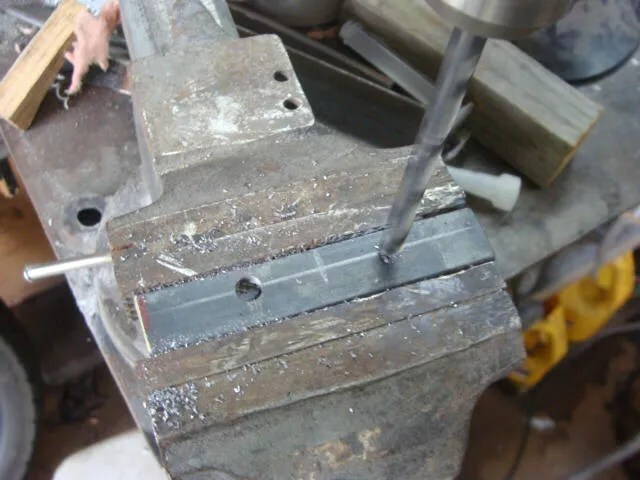 Now, I had to fabricate a way to “lock” the adjustment tang into position after I determined the proper height for the beam of the Buell headlights. 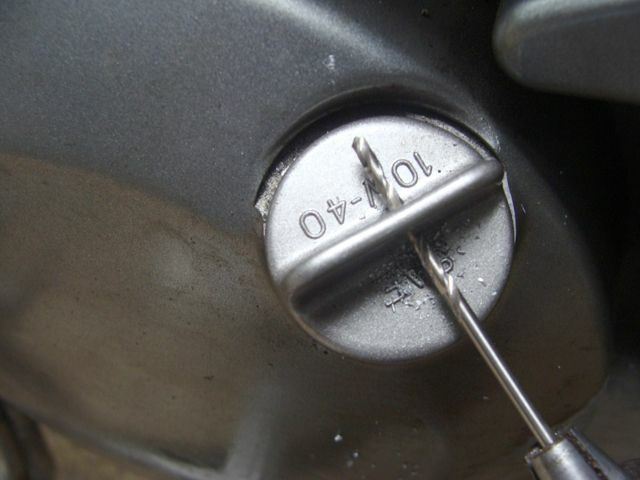 My plan was to use a bolt as my locking mechanism. I fit a short length of steel tubing to the longer “adjustment tube”…..
….and welded it to the adjustment tube. 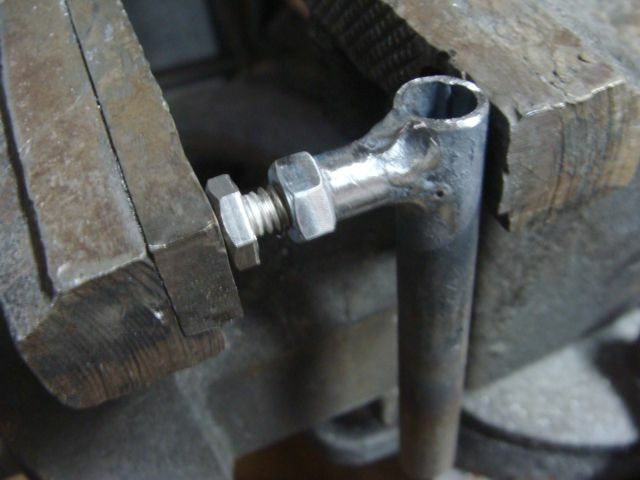 I threaded a 1/4:20 bolt into a 1/4:20 hex nut and clamped the hex nut to the “bolt locking tube”, using my vise. 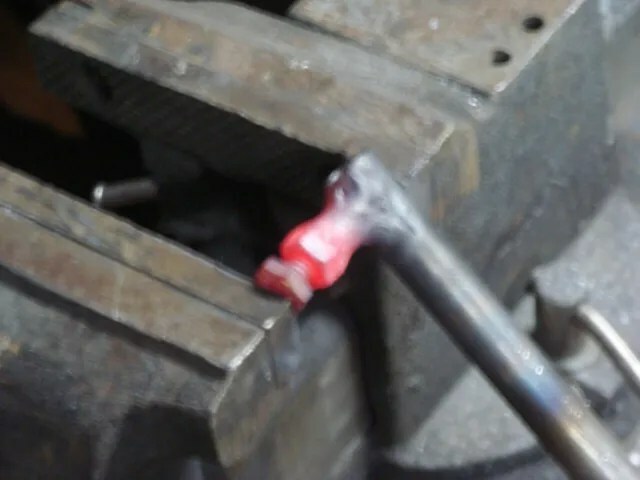 I welded the hex nut to the locking tube. I slid the adjustment tube assembly back into the stock fairing bracket to check how it worked. 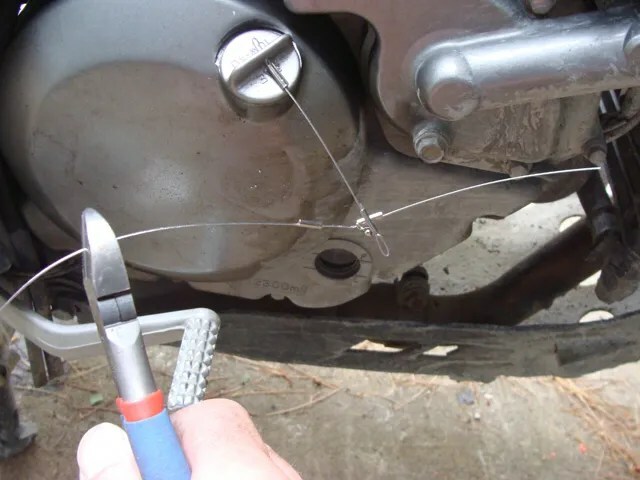 It worked fine! 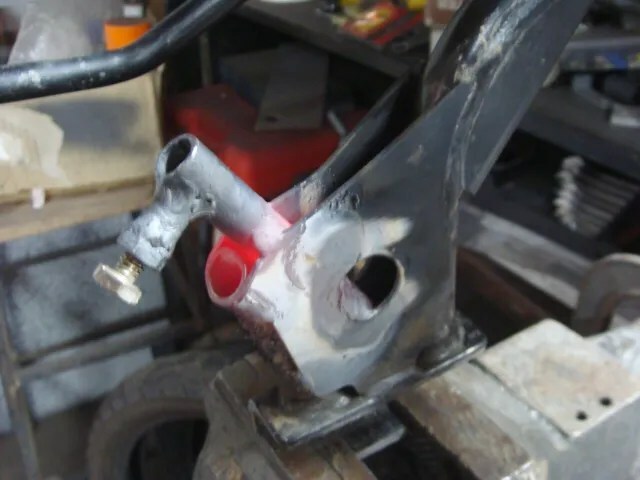 Next, I removed the stock steel from the motorcycle and welded my adjustment tube to it. 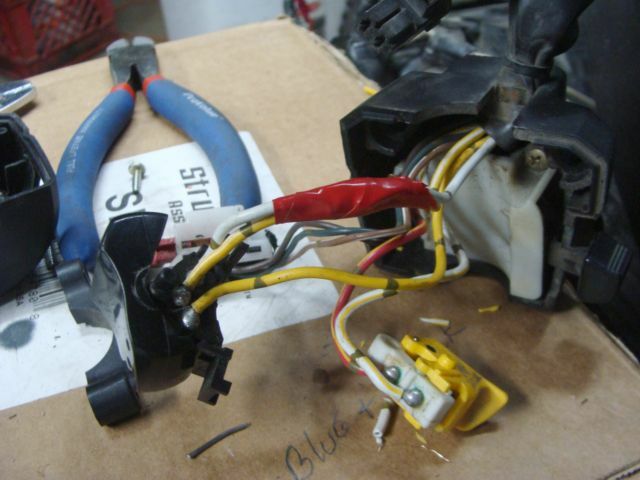 I did have a minor electrical problem with this modification. The Buell headlights were advertised as having H4 bulbs. That would mean that they would “plug-&-Play” with the Strom wiring. 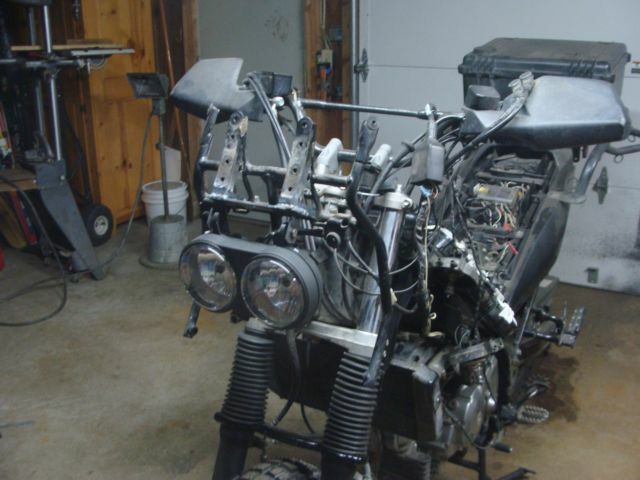 Unfortunately, the Buell headlights are for H7 bulbs; different wiring. 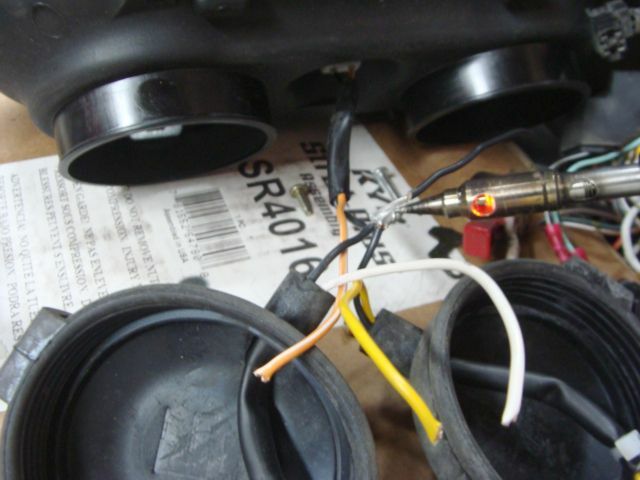 The OEM headlights have 3 wires to each bulb. 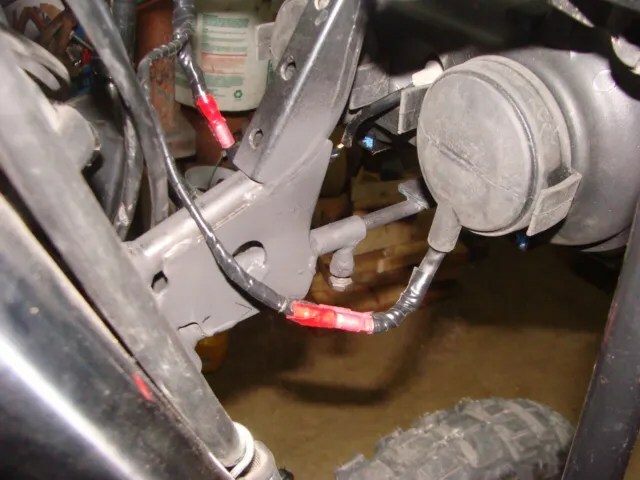 The Buell lights have two wires for each bulb. 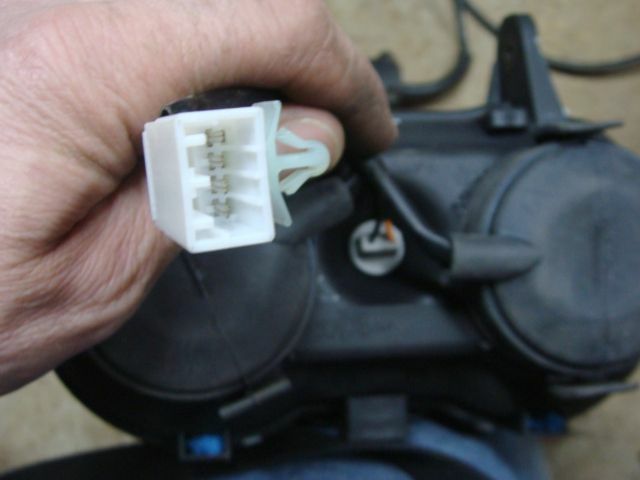 Here is the connector off of the back of the Buell light. 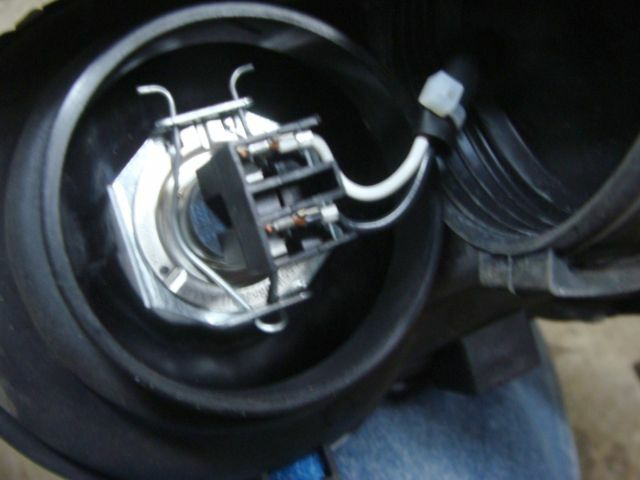 Of interest is, there is a small light bulb between the two main bulbs of the Buell headlights. 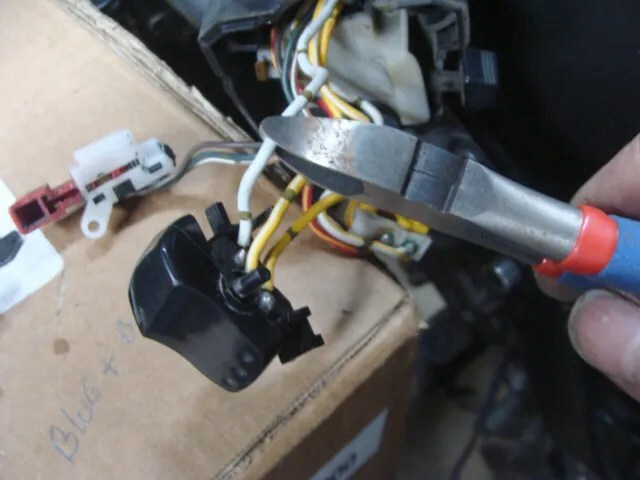 If you look at the above, “connector” photo, you can see the wiring for that right below my hand, in the back of the headlight assembly. 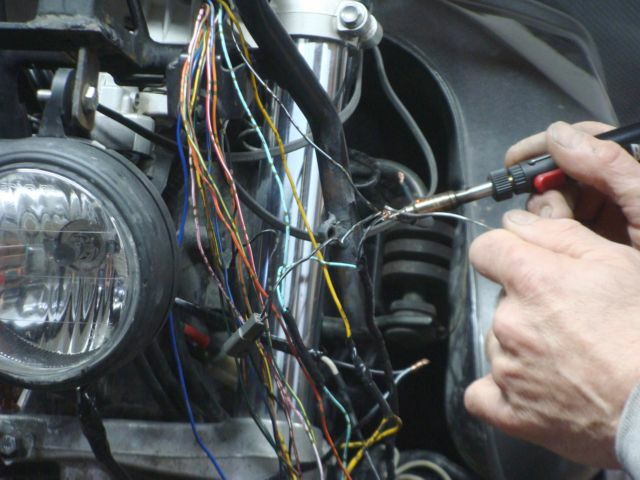 I had rewiring to do to make this all work! 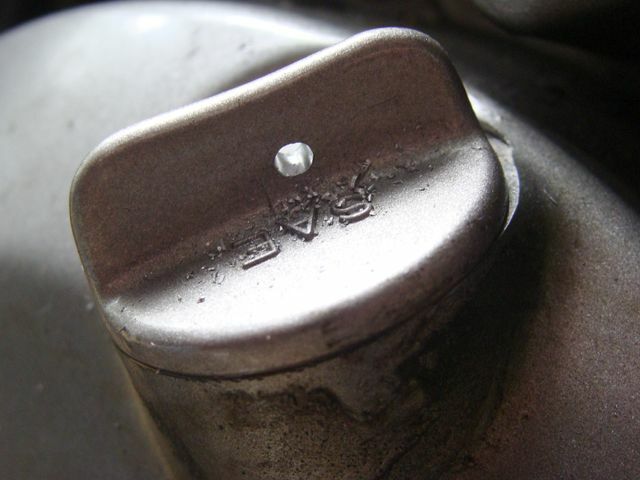 The Strom headlight bulbs both illuminate on the “Low” setting, and they both illuminate on the “High” setting. 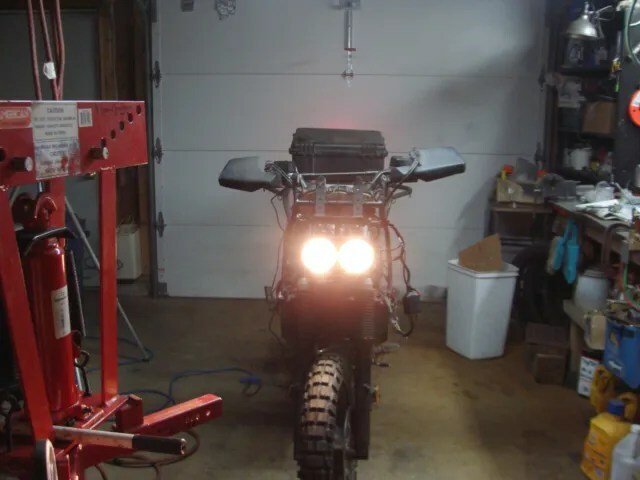 The Buell headlights work with only one bulb illuminating on the “Low” setting, and both bulbs illuminating on the “high” setting. 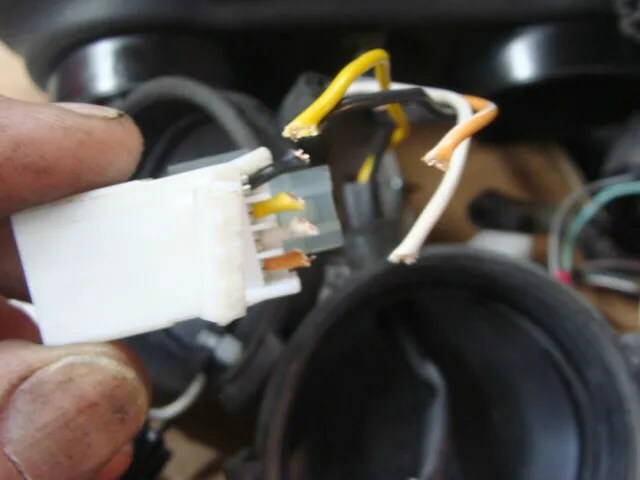 So of course, the first thing I had to do was cut the Buell plug off of its harness, so that I could to begin to identify what wire did what. 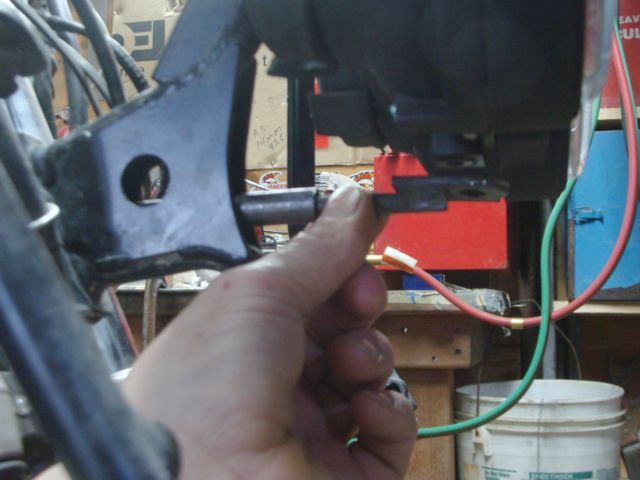 I also had to open up the light switch housing on the left handlebar grip. 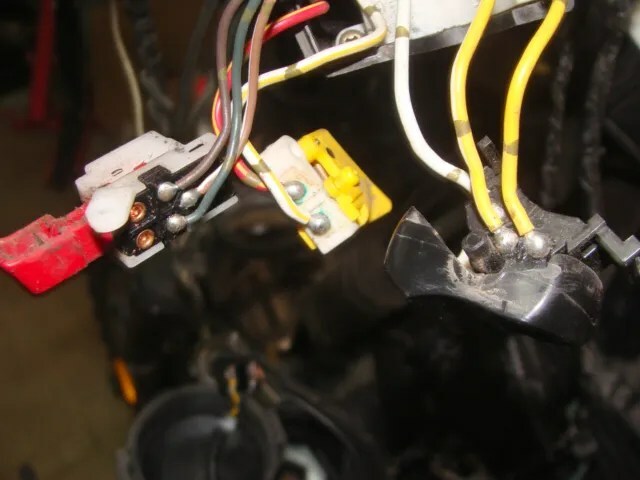 Using the Buell headlight assembly, laid out on top of a cardboard box, sitting right next my bike, and the stock switch and wiring from the bike, I was able to determine, “what wire did what”, when I flipped from “Low Beam” to “High Beam”. 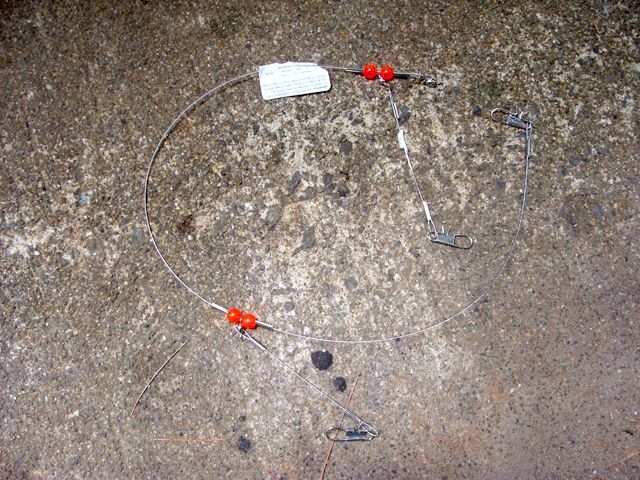 It was easy enough to identify which were the ground wires on the Buell lights. 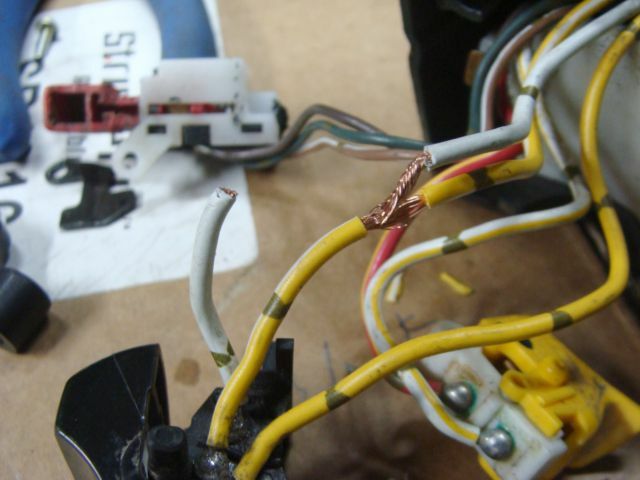 I soldered them together. 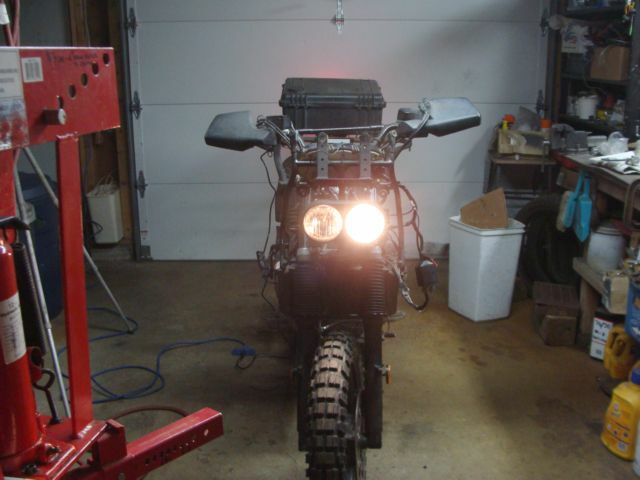 And, here is “High Beam”. However, the above setup is wrong. I didn’t discover it until I rode the bike at night. 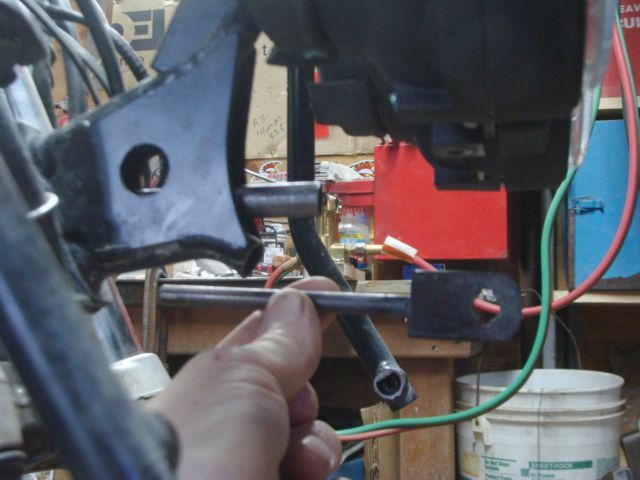 The “Low Beam” light on the Buell assembly is the RIGHT headlight and bulb. “High Beam” is the LEFT headlight and bulb + the right headlight. There IS a difference! 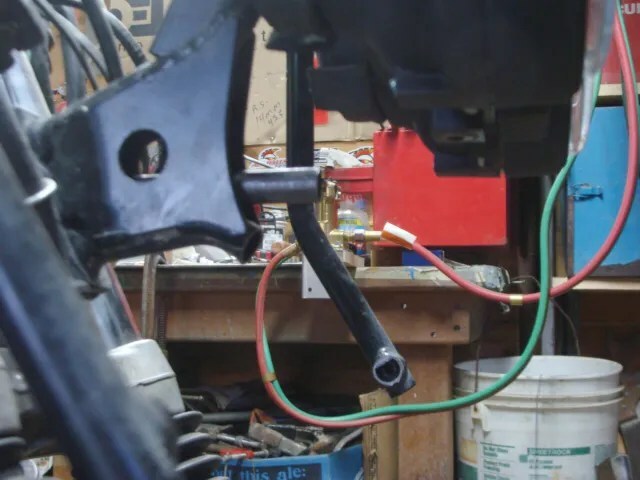 Since doing the above work over two years ago, I made some wiring adjustments when I built my front fairing. Now, that was a lot of fun! 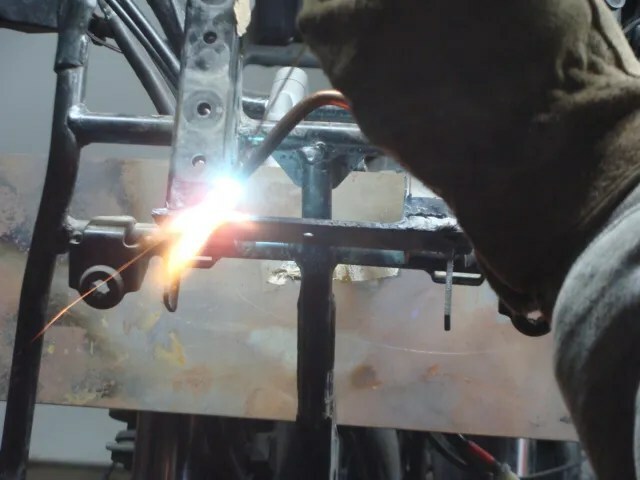 I will share the story of how I built my front fairing at a later date. 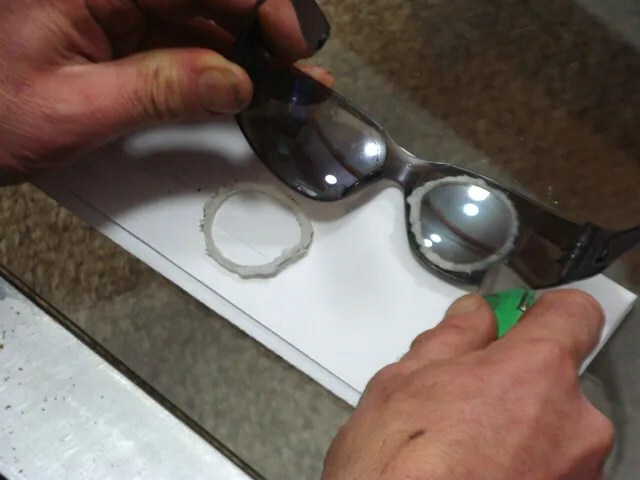 Back in May of 2008, I set out to create an inexpensive pair of prescription sunglasses for myself. I didn’t want to spend the $500 that it was going to cost me to purchase “professionally made” prescription sunglasses. So, I worked with what I had, and created my own. 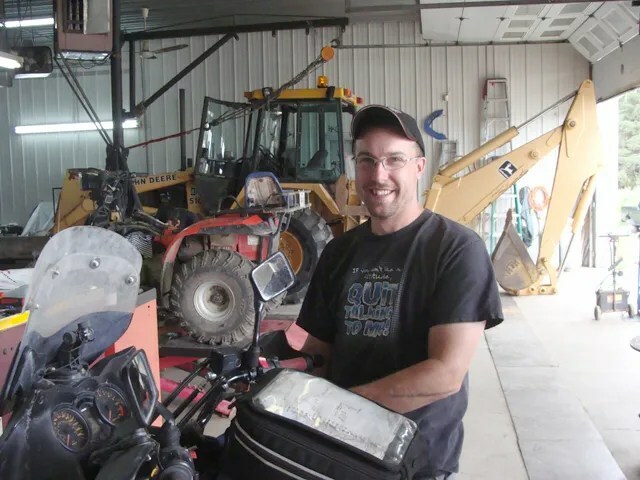 Since December of 2010, I began taking flying lessons, (On and off; when I can afford to.) The ultimate goal is to obtain my Private Pilot’s license, and to learn how to fly the experimental airplane that I am currently building, (www.sonex1504.com). To legally fly the plane that I am training in, by myself, (the famous first “solo” flight), I have to have a medical examination. Part of that exam is to test my eyesight. My last eye exam was, October 31, 2007. I know that I am having a struggle seeing some things, and I attribute that fact to just more then the badly scratched lenses I have now! I scheduled an appointment for this past Friday to see just how much my eyes had changed. I also brought along my “homemade” sunglasses for the eye doctor to look at. I wanted to get the eye doctor’s “professional opinion” on the prescription sunglasses I had made for myself. 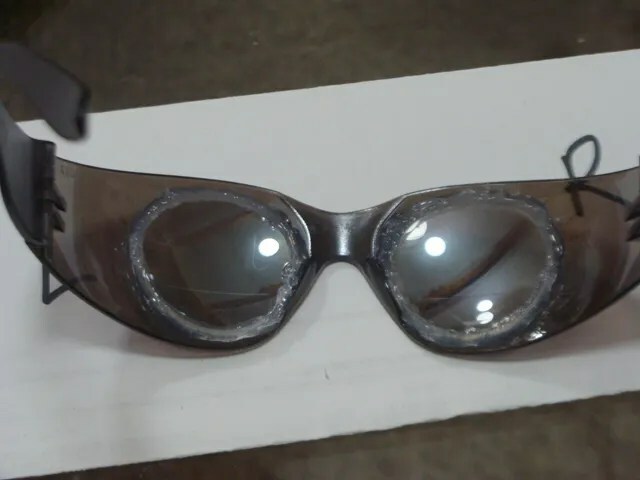 I have made three pairs of these homemade, prescription sunglasses since 2008. 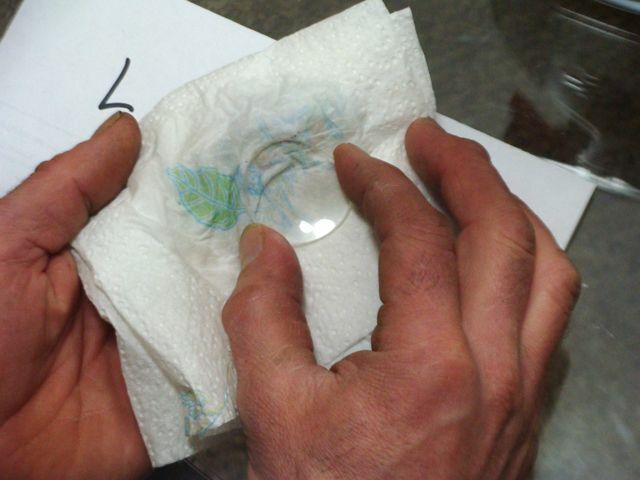 The lenses are relatively inexpensive plastic, cut to a bifocal prescription for my eyes. 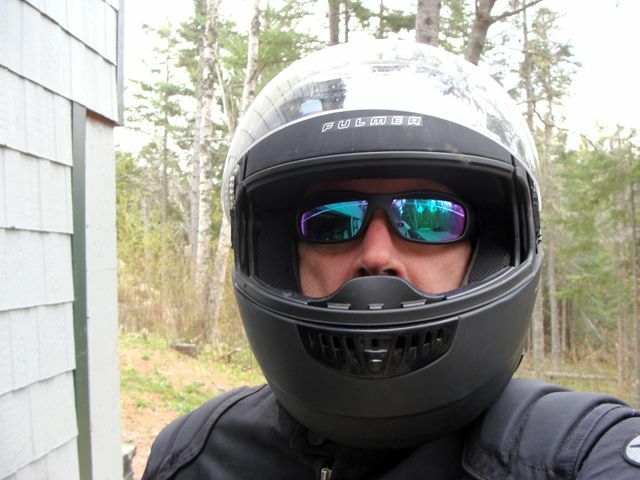 Although I wear a progressive “tri-focal” prescription in my “daily” glasses, the bifocal prescription works fine while riding my motorcycle. I can look ahead and side to side without any issues. I can also flick my eyes down to view a road map, situated in a map case on top of my tankbag. No eye adjustments are necessary! 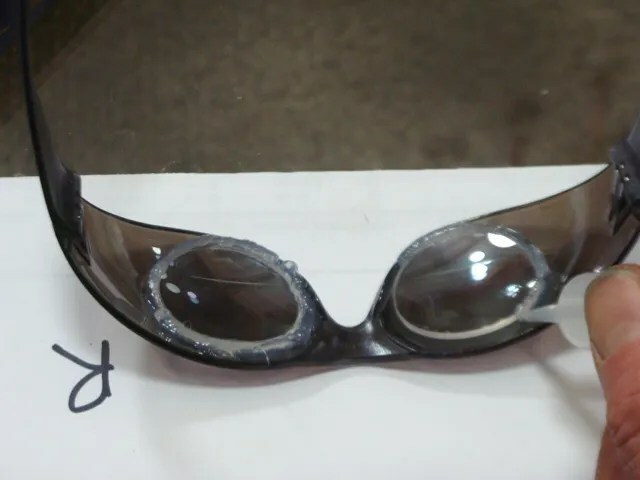 I removed the lenses from my old, worn out, cheap safety glasses. 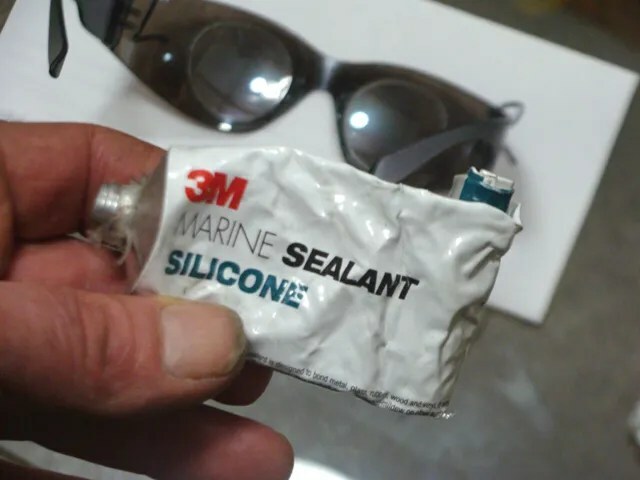 I peeled off the old silicone adhesive sealant that I use to “bed” the lenses to the glass frames. I cleaned up the lenses. 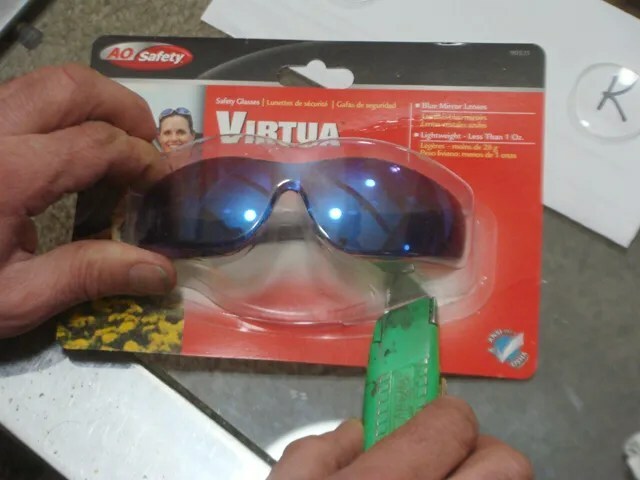 I opened up a new pair of safety-sunglasses. I purchase these at Lowe’s for about $10. I positioned the lenses into the new glasses. 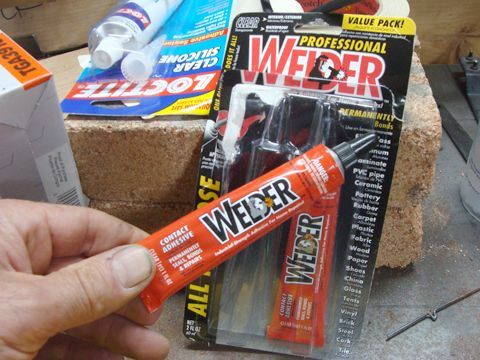 At the boatyard I work at, we have many open tubes of this silicone adhesive kicking around. I grabbed one of the old tubes and brought it home. I jammed a West System epoxy syringe into the gap between the glass and the metal framework to my coffee table. 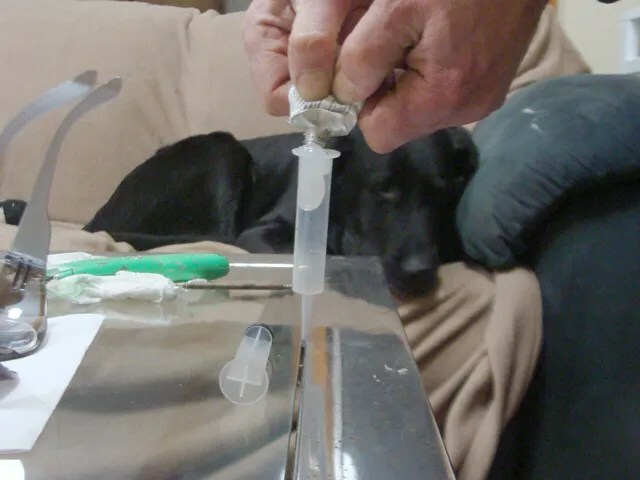 Then I squirted the silicone into the body of the syringe. (My Black Lab, “Reuben” is supervising!). 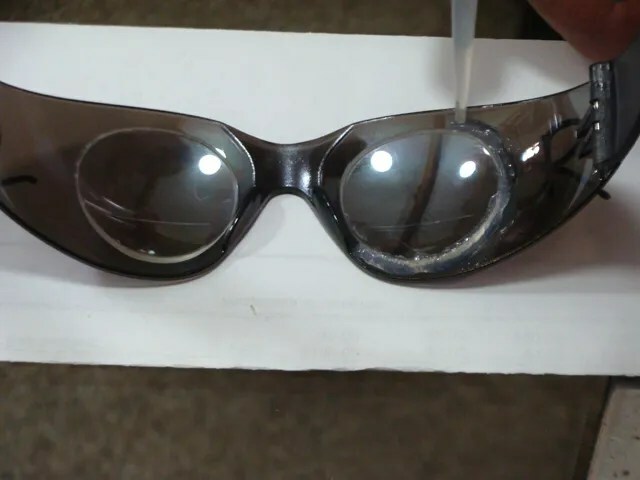 Using the syringe as a “caulking gun”, I laid a bead of silicone around each lens to bond it to the glasses, and also to seal off any water or dirt from getting between the lenses and the glasses. “Caulking job” completed. Now I set the glasses aside for an overnight cure. 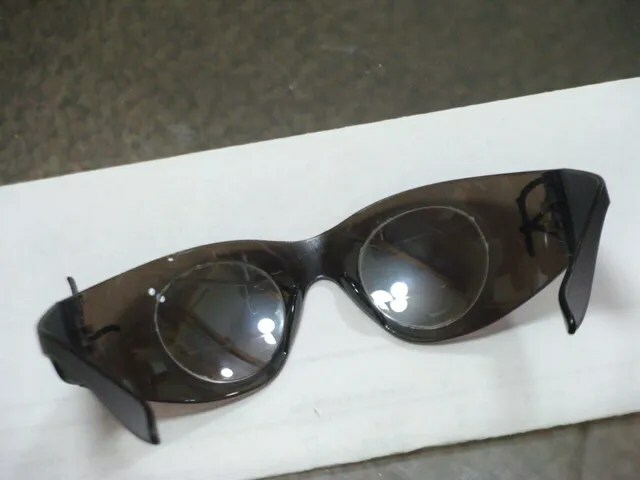 Below is a photo of what the glasses look like. However, it is a photo taken back in 2008, and is of a different set of sunglasses that I used back then. You get the idea, though. They cost about $90 for me to make. 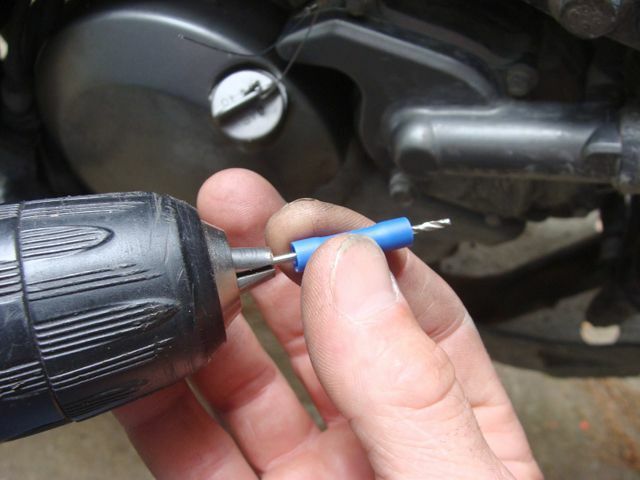 Before I departed for last weekend’s trip, I had to do some maintenance to my bike. I mounted up a new set of Shinko 705 tires, changed the motor oil, changed the fork oil, adjusted my Race Tech emulators, and swapped out my air filter. 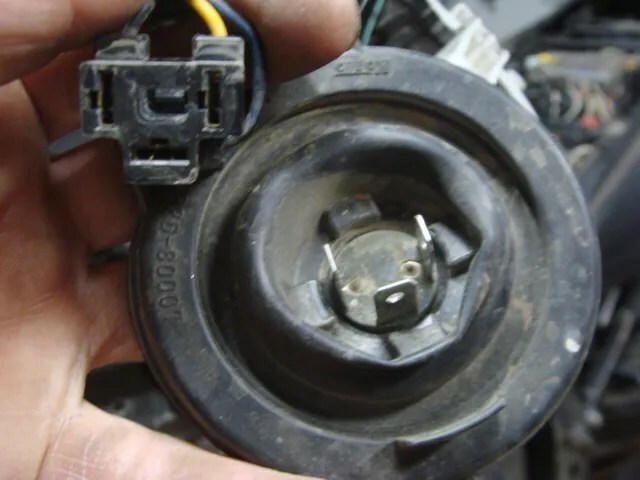 When I separated the top portion of the airbox and flipped it over to inspect it, I noticed quite a bit of dirt had collected along the inside flange of the lid, (the area where the gasket of the air filter sits.). Unfortunately, before I took a photo of the grit, I cleaned it off. 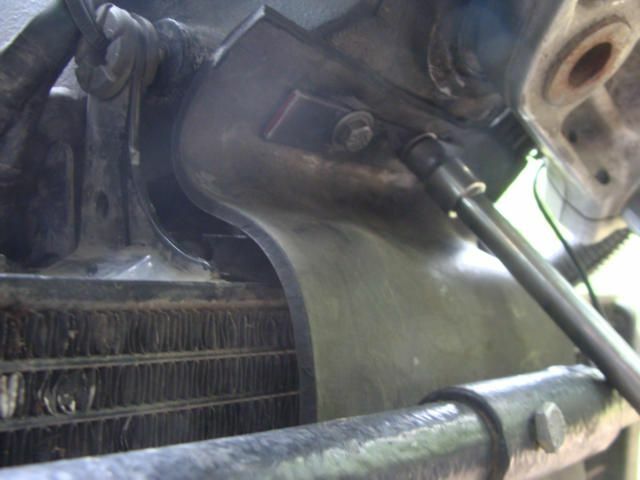 But, in the below photo, you may be able to see evidence of “muddy water” residue that has dried on the underside of the airbox lid. 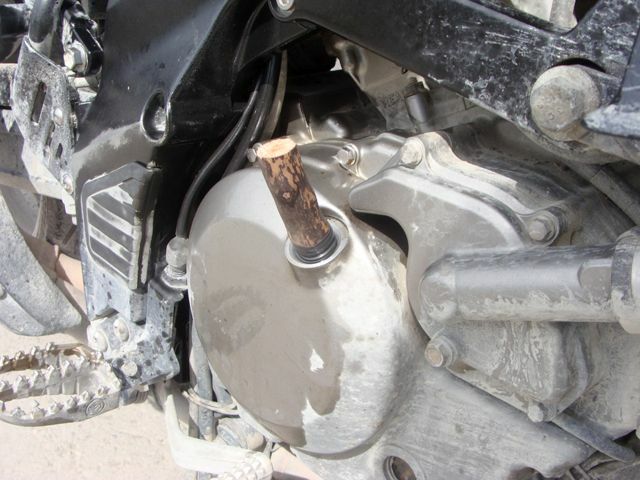 I have modified my motorcycle. I do not have any of the OEM fairings on the front of the bike anymore. 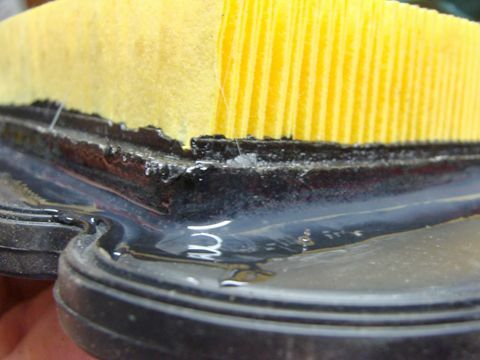 Because of this, water has a freer pathway where it can more easily get driven back towards the airbox. 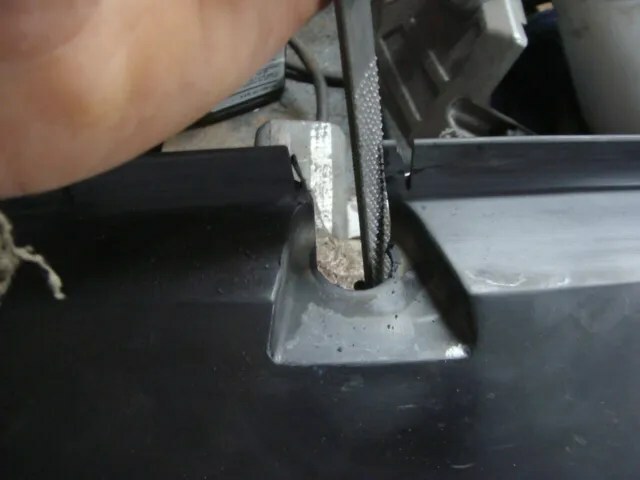 Previous to this particular airbox inspection, (With the OEM fairing configuration), I had never found dirt that had gotten “forced” between the lid and the bottom portion of the airbox before. 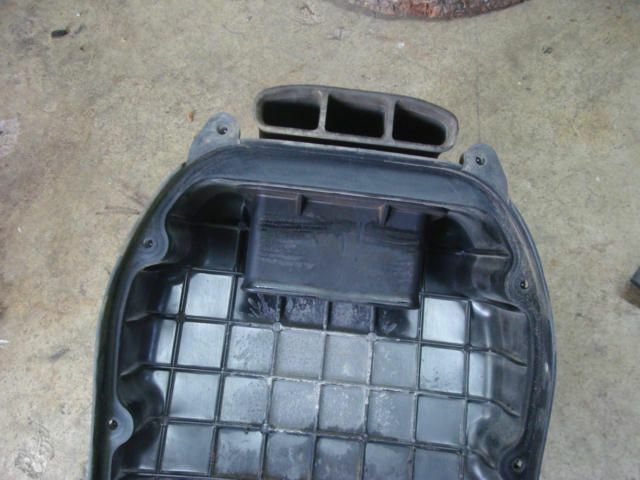 I cleaned the grim out of the flange, and decided to add some protection to the airbox. 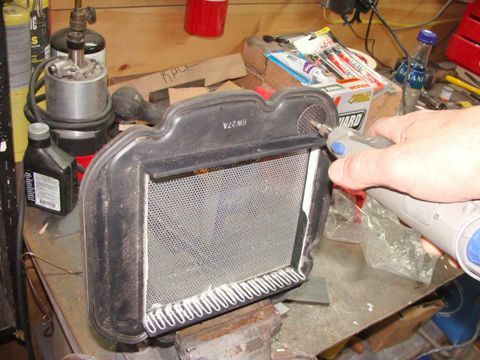 Using a pair of scissors, I cut a piece of 3/32″ sheet rubber I had scrounged from work. 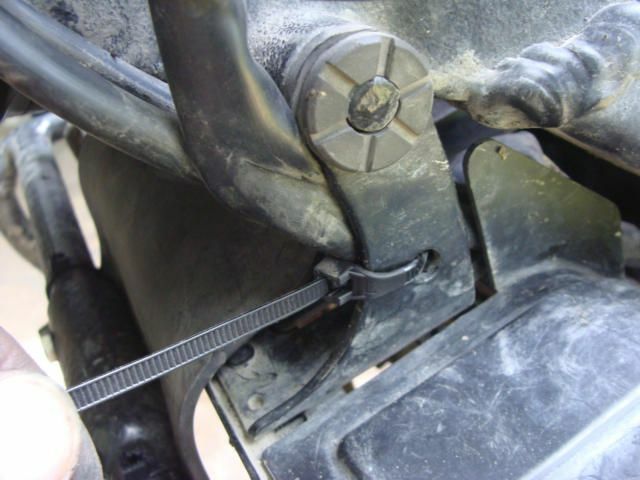 I then slid the piece of rubber, up behind the snorkel tube and fastened it in place with two zip-ties. I felt, I now had an effective “mud flap” to deflect debris from infiltrating the seam between the lid and the bottom of the airbox. 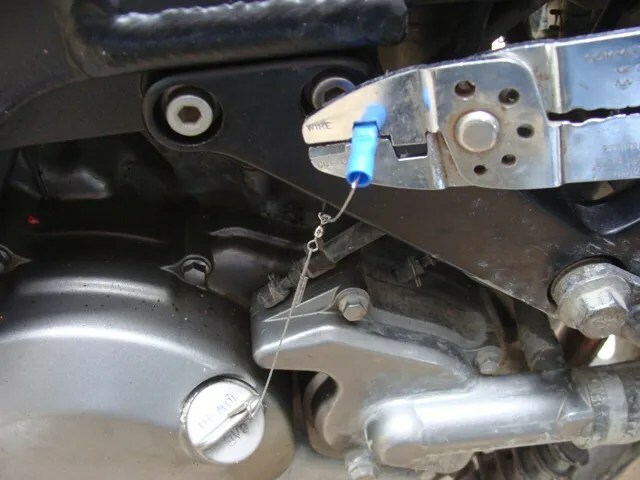 I started poking around the front end of my motorcycle and came up with a solution that worked. 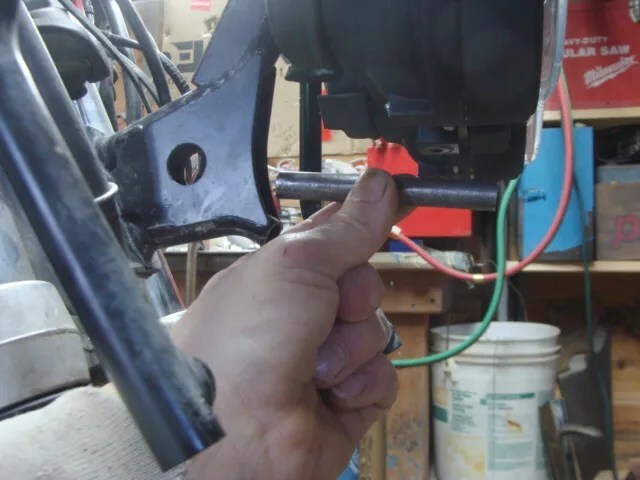 Just behind where the steering stem passes through the bottom portion of the motorcycle frame, there are two holes that are drilled and tapped for a 10mm bolt. 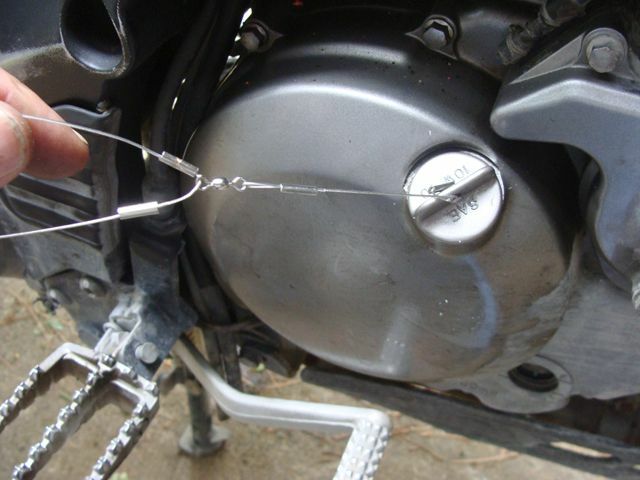 The left hole is used to secure a “clamp” that holds part of the wiring harness to the bike. 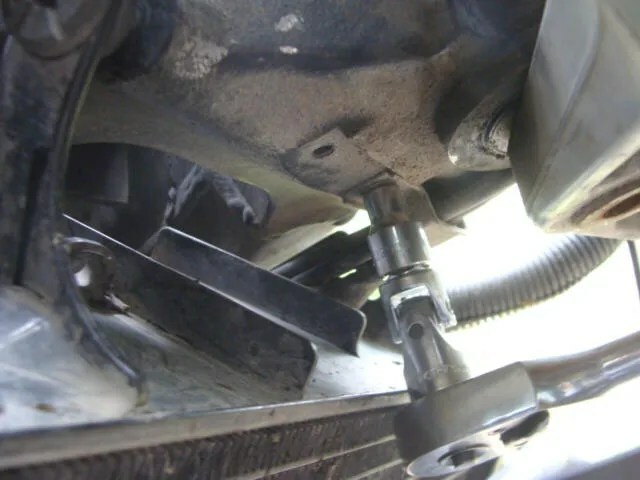 I removed the harness clamp. 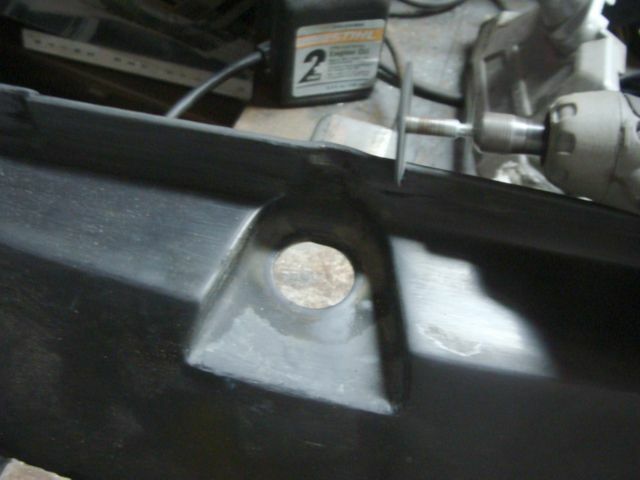 Using a tape measure, I figured out what an appropriate width would be for another rubber, “mud flap”. 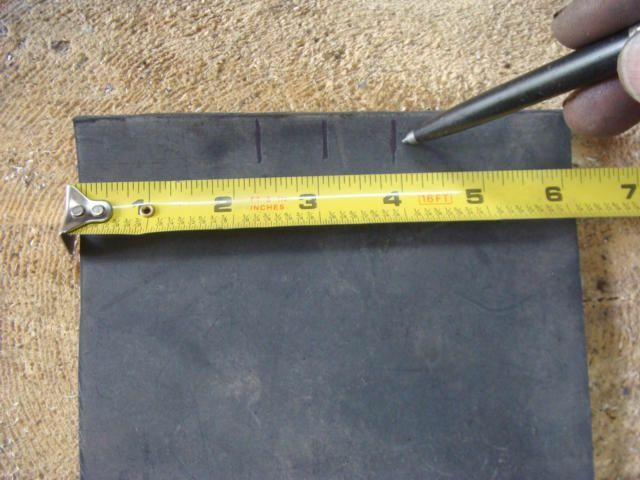 I also laid out where I needed to drill holes through the rubber sheeting. (I really needed a hole punch for doing this. 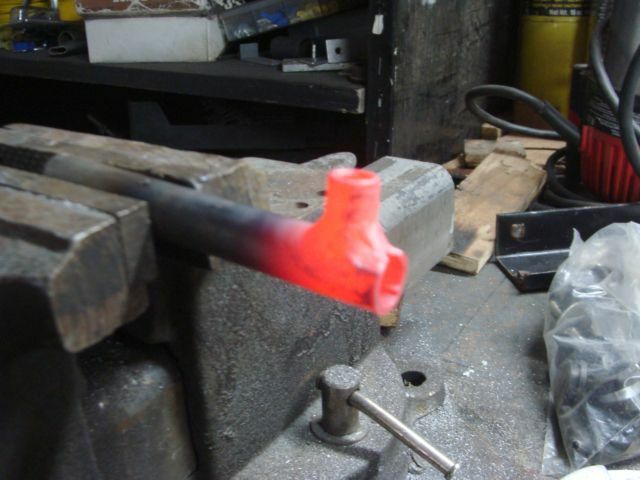 Drilling through rubber sheeting isn’t the appropriate technique for acquiring a hole.). 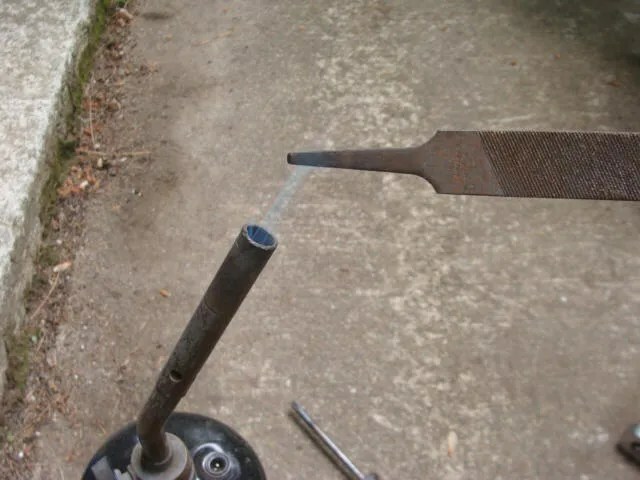 …..and drilled two holes through it that corresponded to the threaded holes in the bike frame. 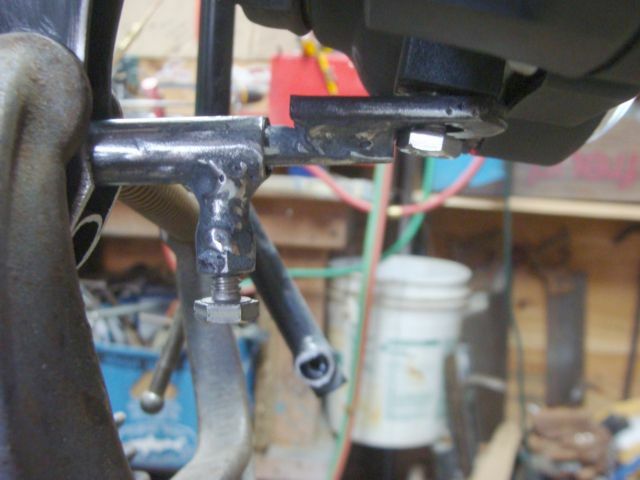 I “dry fit” the steel strap by threading the bolts through it and into the bike’s frame. Everything was “A-O-Kay”. 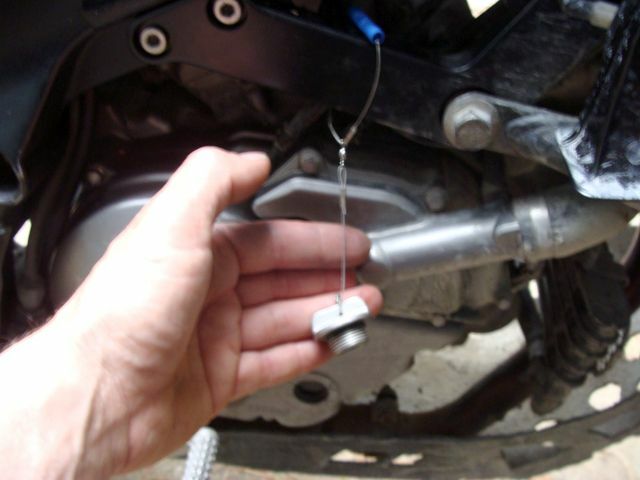 ….and bolted the unit to the bike. 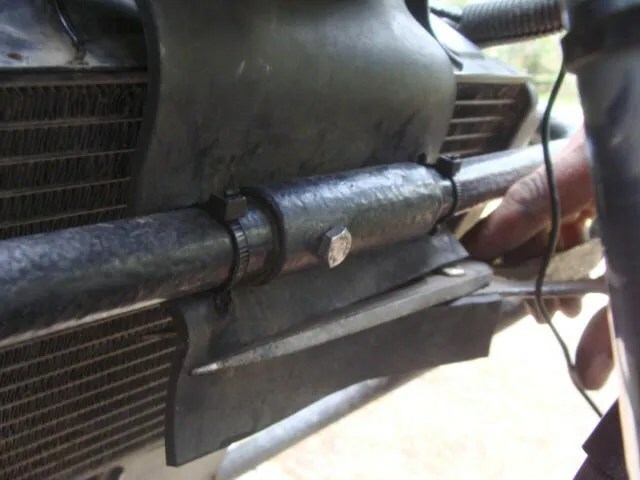 I tucked the “mud guard” up into the space over the radiator and let it hang down behind the cross member of the crashbars I made for my bike. I was looking for a “natural drape” of the rubber guard. 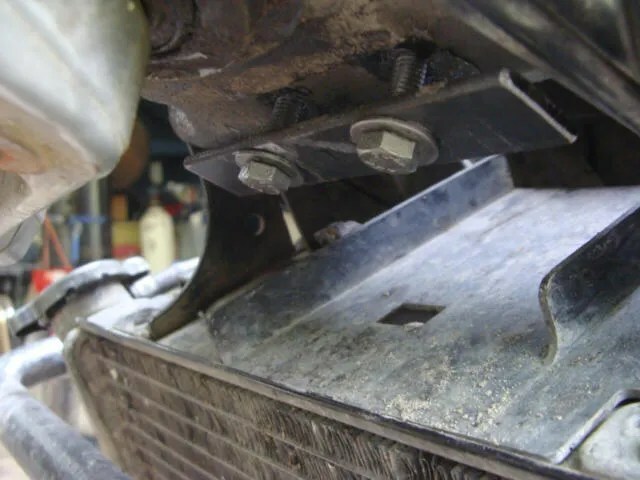 When I was satisfied that the mud guard was in its proper place and would do its intended job, I marked where I needed to “drill” two more holes. As I said before, drilling through sheet rubber is not a good solution. 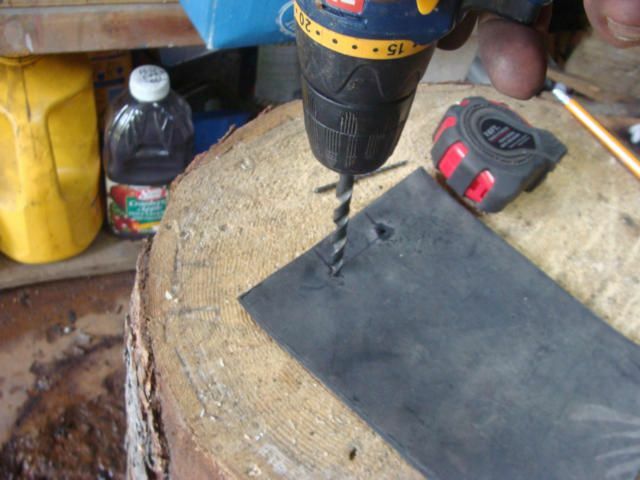 As the drill bit spins through the rubber, it tends to “fetch up” and twist the rubber around the body of the drill bit. 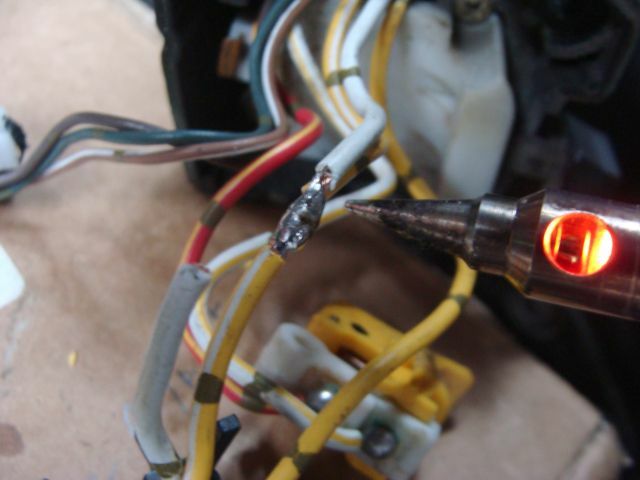 It also, pulls the drill bit, in a sort of uncontrollable fashion, away from you. I decided on a safer solution because I was so near the radiator. 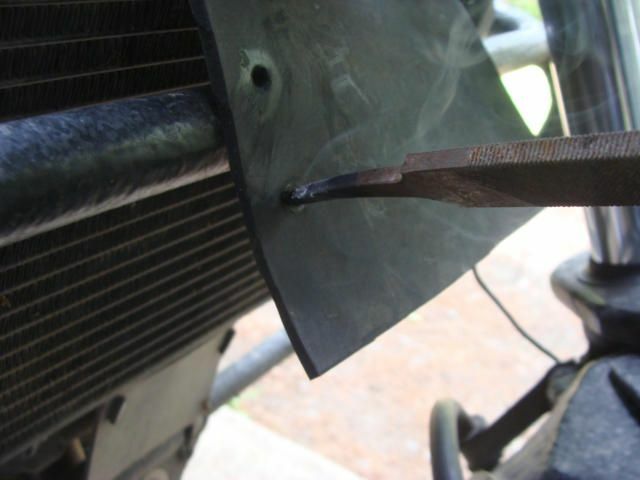 I didn’t want the drill bit to “pull” itself through the rubber and right into the radiator!!! 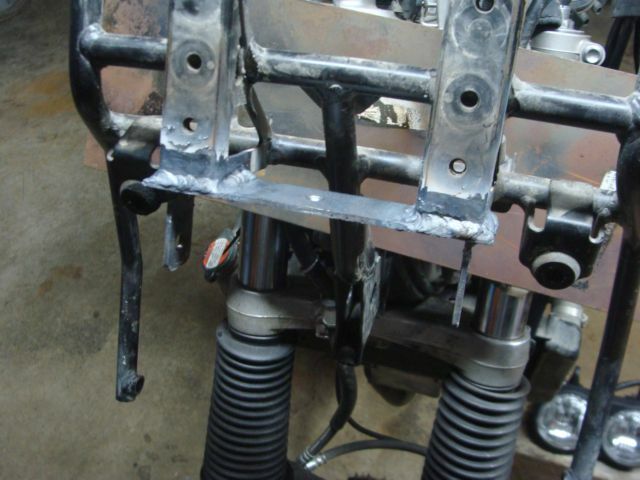 …and “melted” four holes through the rubber sheeting. 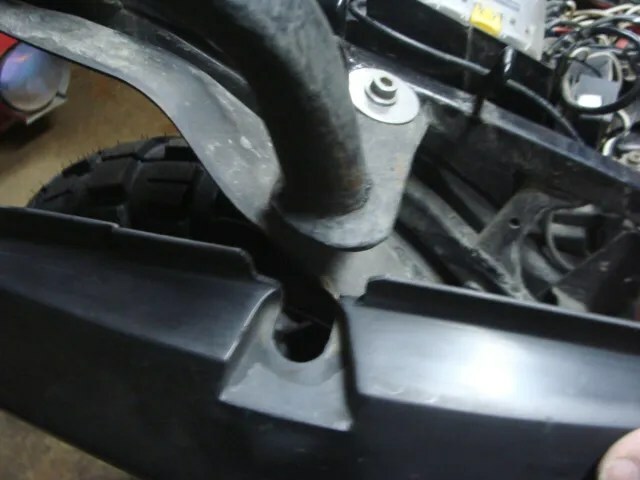 Using zip-ties, I fastened the bottom edge of the mud guard to my crashbars. 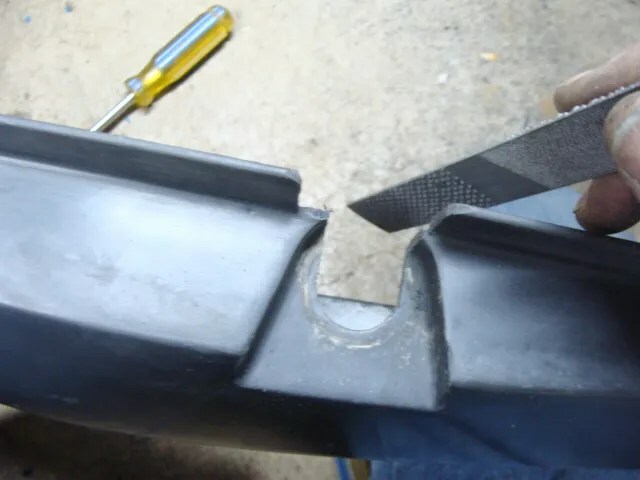 Once the mud guard was fastened, I cut the excess rubber off of the bottom edge. 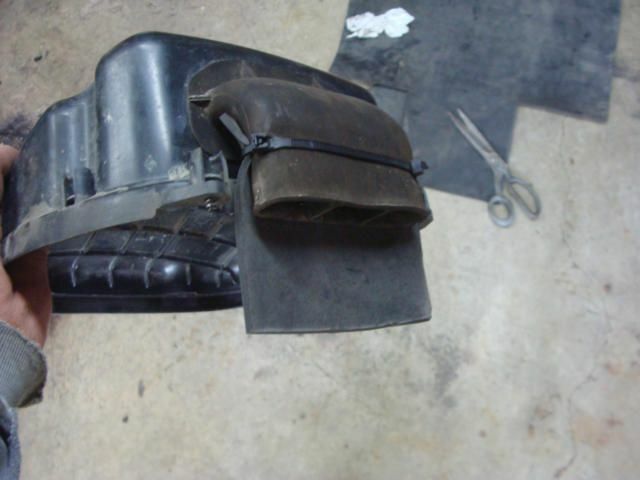 Here is the finished, “Airbox Mud Guard”. 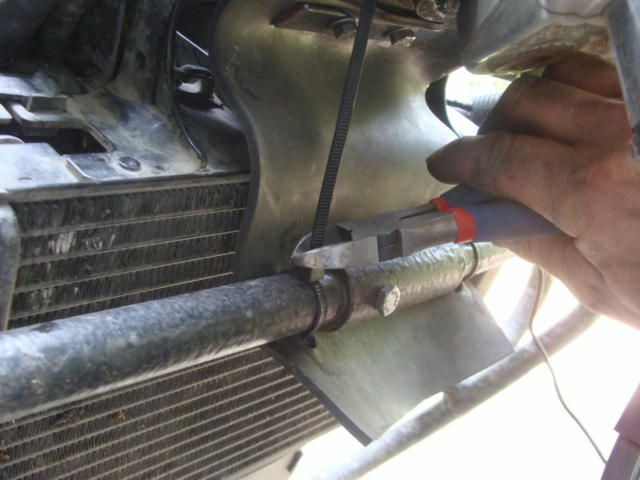 Finally, I used a zip-tie to secure the wire harness to the anchor tab on my radiator. EDIT: May 04, 2012. 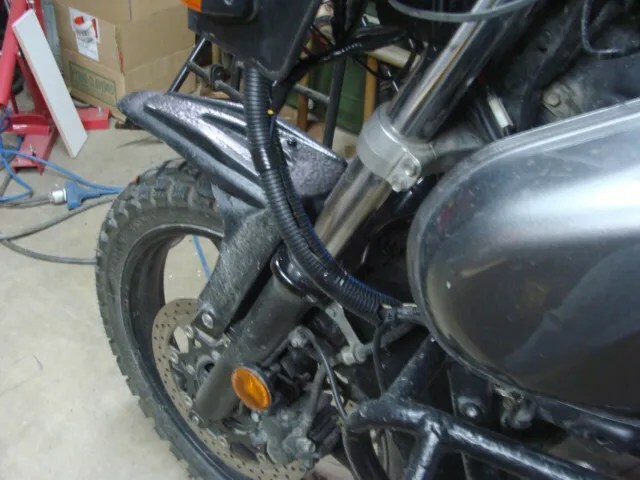 The snorkel tube “Mud Flap”, and the airbox “Splash Guard”, have been excellent additions to my motorcycle! A lot of the riding I do takes me to remote places; or to places that don’t have a local motorcycle dealership nearby. 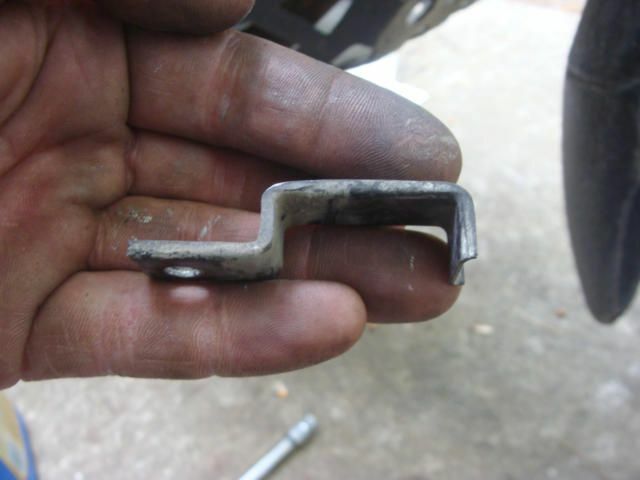 This is the number one reason I WILL NOT purchase and ride BMW motorcycle! In my area of New England, and in the provinces of Québec and New Brunswick, Canada, BMW dealerships are sparsely located. It would be very expensive to buy, or to have parts shipped to a rural location, if I needed them. 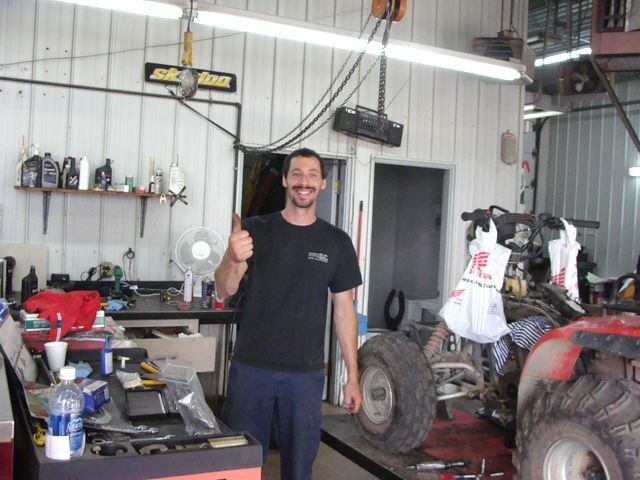 I have a much greater chance of finding a Suzuki dealership, then a BMW dealership where I ride! 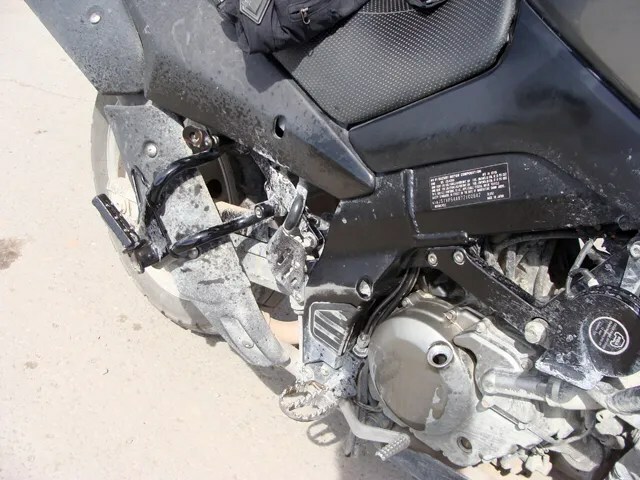 A couple of weeks ago, when I dumped my bike into the, “Moncton Mud Puddle“, I didn’t have a clue of what I was going to be up against financially in repair costs. But, back in the woods, literally “up the creek without a paddle”, I was feeling relieved that, “It could be worse. 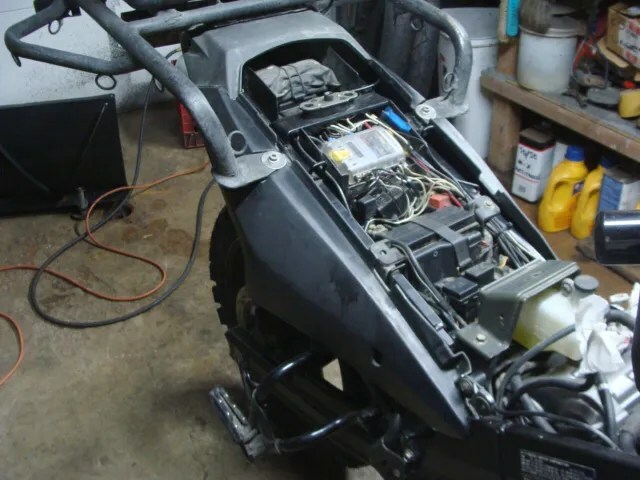 I only own a Suzuki and not a BMW.” I felt fairly confident that, once I got out of the woods, and got some help, I could make the repairs myself. About $75 and 6 hrs of work, I was riding home, and grinning from “ear-to-ear”! My bike and I survived another adventure together! 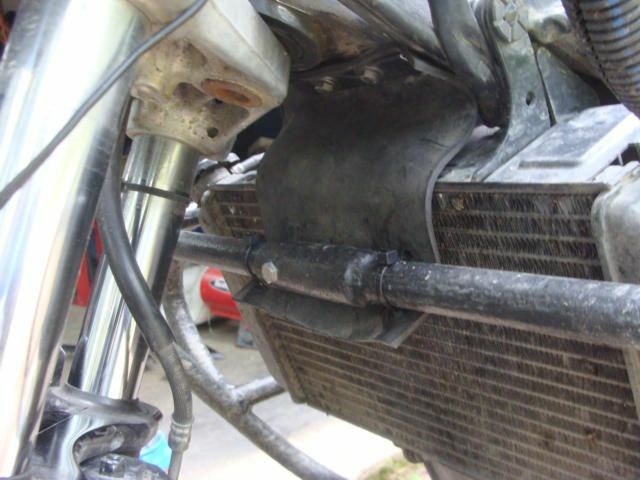 I did not get any water into the bike’s air box. It was clean and bone dry. But, what if I did? 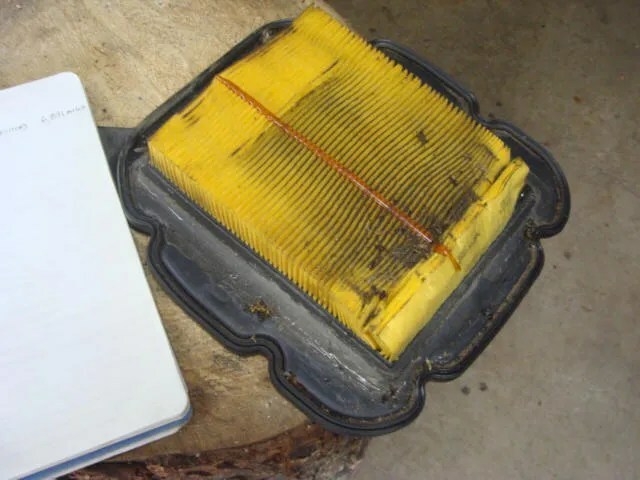 At the very least, I was going to need a new air filter. At a Canadian dealership, my guess is, that would cost around $65. That’s IF I could find a dealership! But, I can find an auto parts store, or a Canadian Tire, or similar store, like a Wal-Mart. 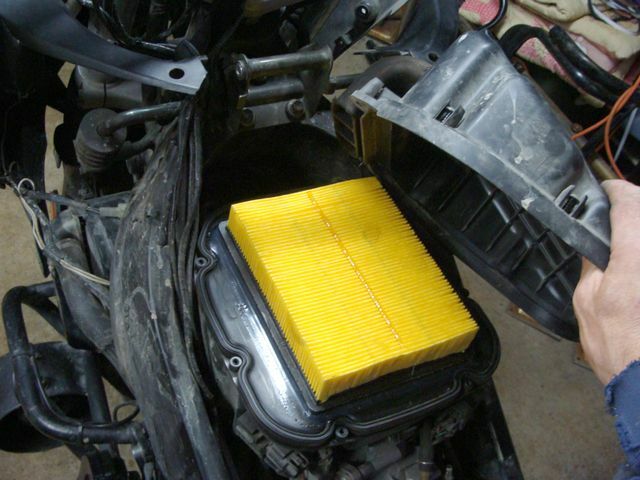 If I need to, I can now fit a new air filter to my bike from nearly every geographical location I currently ride in! 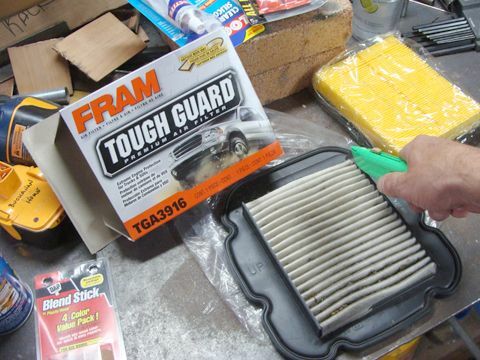 I spent quite a bit of time at my local Wal-Mart going through all of the Fram air filters they carry. 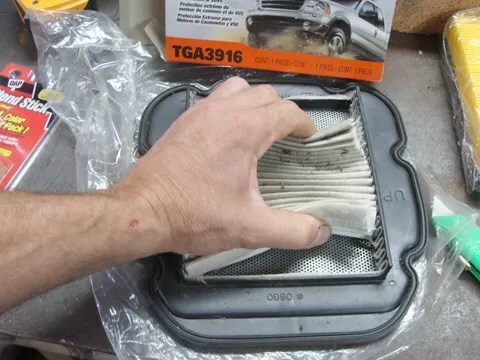 The CA3916 is the standard paper Fram filter that fits nearly perfectly over the OEM filter hole. I decided to purchase the Tough Guard version. 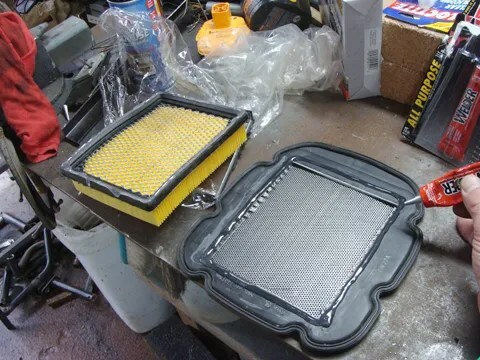 It is a pre-oiled filter designed for SUVs and pickup trucks, where their working environment is dustier then normal, street use. 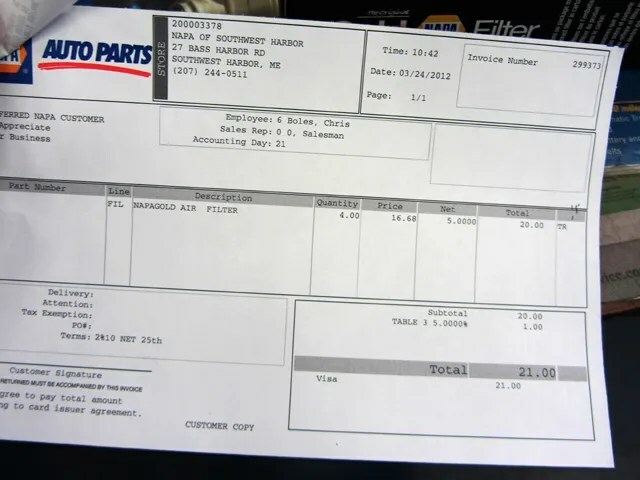 That part number is: TGA3916. I saved my old air filter from my last change 30,000 miles ago. I have modified it using the techniques I describe below. 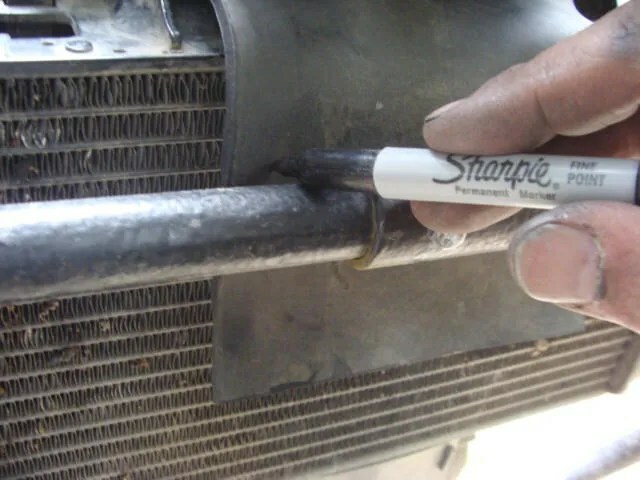 I used a utility knife to cut the old OEM filter media out of the filter throat. I removed the old media. I tried using my utility knife to cut the “throat” off of the filter flange. The plastic is too hard. 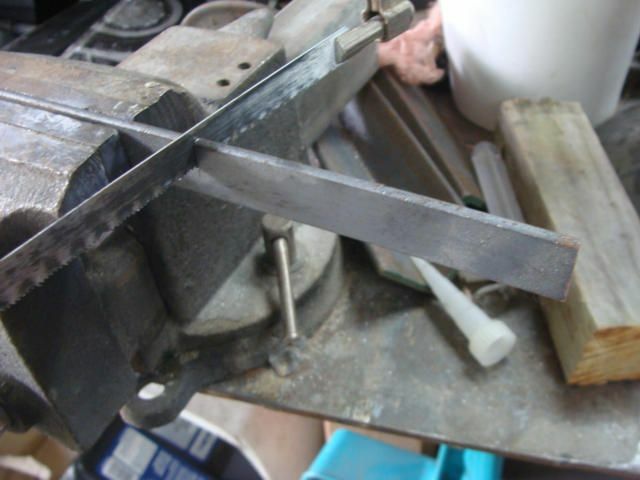 It’s the kind of cutting that leads itself to slicing a thumb or finger….. 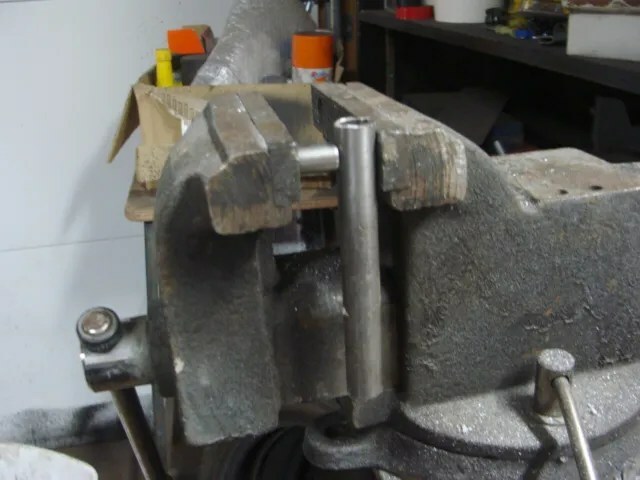 I switched over to my Dremel tool; using a “fibre-reinforced” cut-off wheel. 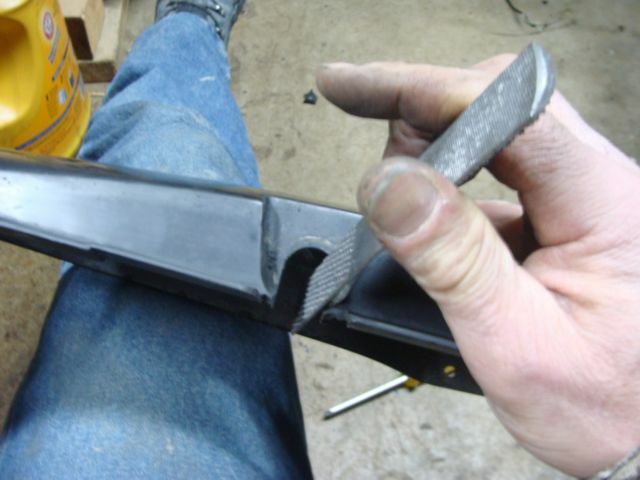 Once the throat was removed, I sharpened up a paint scraper with a file and “cut” what remained of the throat down to the flange; making everything flat and smooth and removing any plastic burrs. 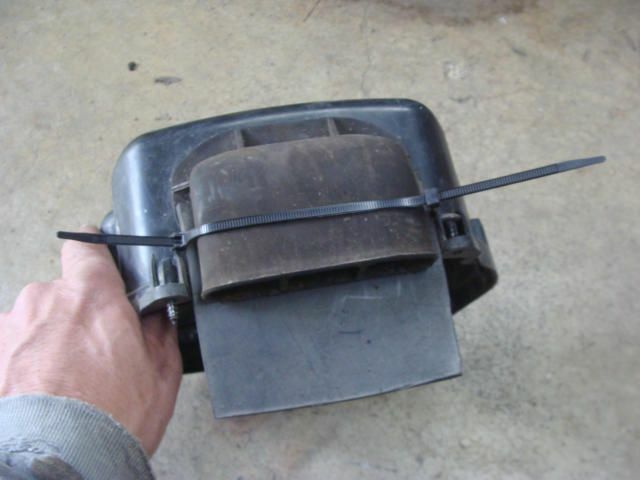 Here is the OEM filter, with the throat removed, and the flange scraped flat. I decided to leave the OEM screen in place. 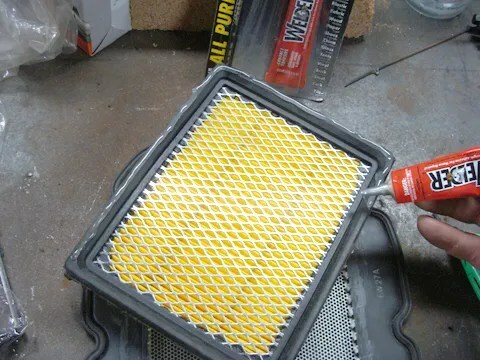 I spent quite a bit of time ruminating on what adhesive to use to bond the new filter to the OEM filter flange. 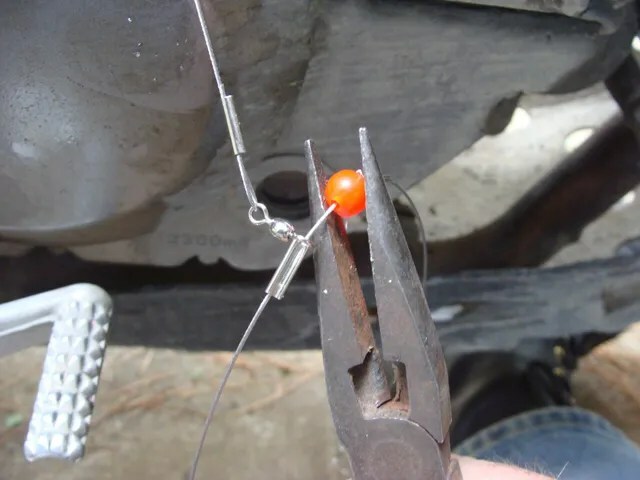 I work in the marine industry and I have access to some “bomb proof” stuff, but I decided to again, “keep it simple”; thinking about future maintenance and subsequent changes. I chose the below product. 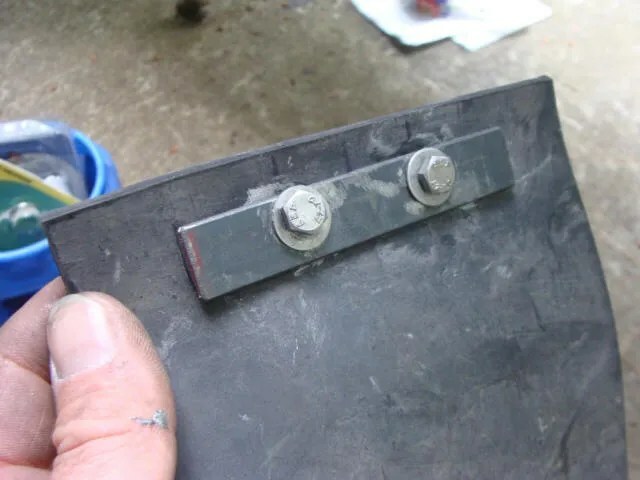 It is a very thick, very tough contact cement. I purchased it at my local Lowe’s. 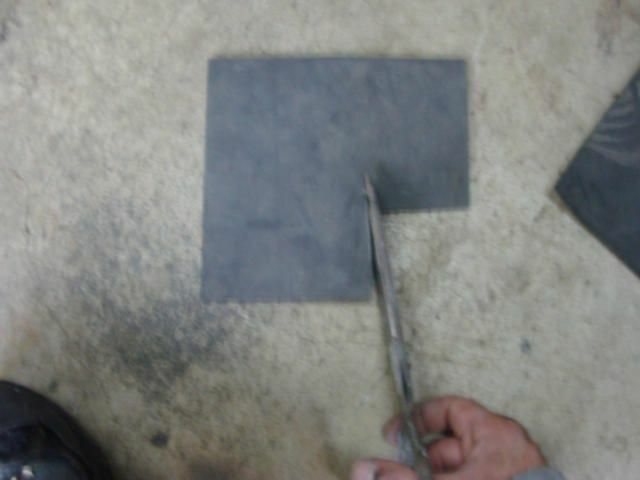 I squeezed a nice bead of the cement around the base of the Fram filter and also around the filter flange. I let these two surfaces dry about 10 mins as per the adhesive’s instructions. 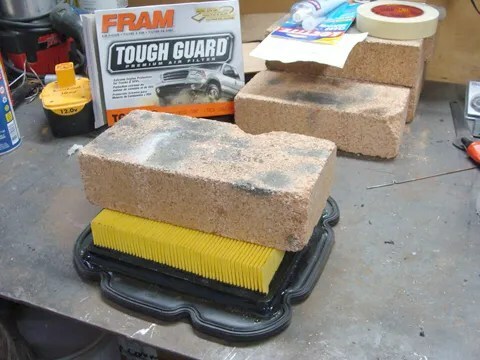 After the allotted drying time had passed, I “mated” the two parts together and placed a firebrick on top. 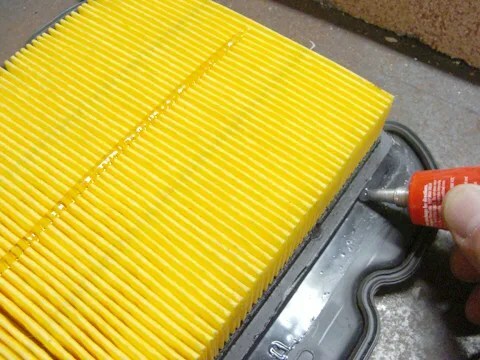 I let the “new” filter sit overnight. 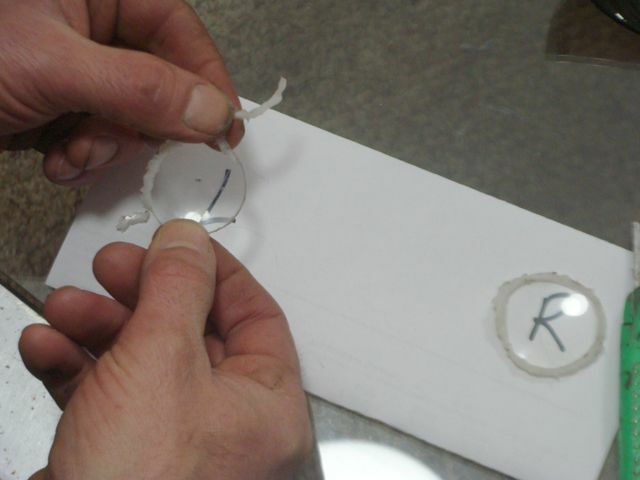 When I got home from work the next day, I examined the glue bond. 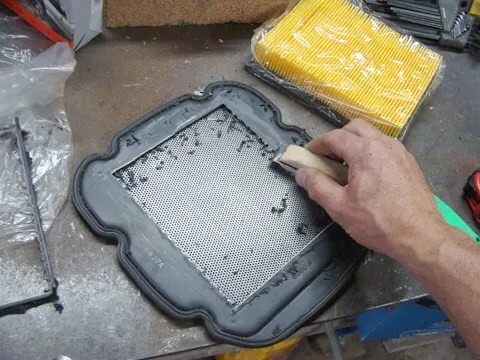 I gave the filter a really good tug to try and tear it apart. It wouldn’t budge. 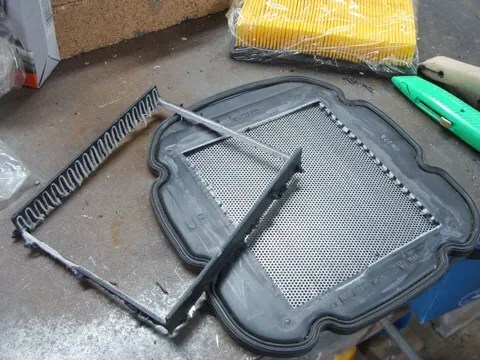 But, I decided, as a precaution to put another bead of the cement around the edge of the filter creating a “filet”. 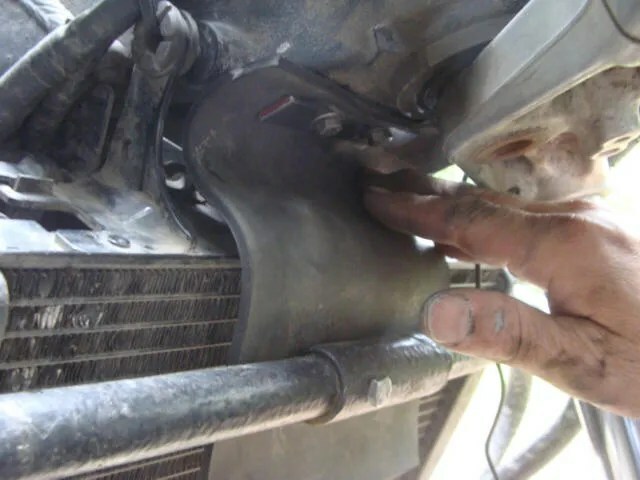 Here is the filter being installed into the air box. 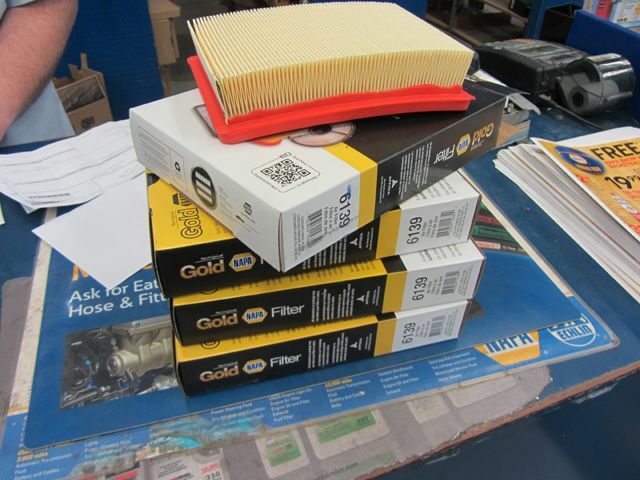 EDIT: This year, for the 2012 riding season, I decided to take advantage of Napa’s, “Gold Filter” Sale. 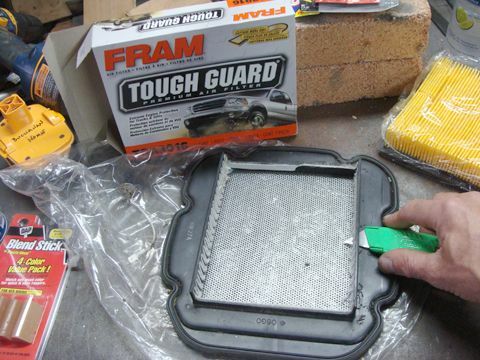 Cross referencing the Fram Tough Guard air filter with Napa’s Gold Filter, combined with a 50% off discount, I purchased four air filters for a total of, $21.00. They will last me more then two seasons.